“Meteorites – How to Recognize Visitors from Space” is an eBook produced by The Meteorite Exchange, Inc. to help anyone identify meteorites. Seasoned collectors will find a rich source of information in one volume. The new enthusiast in the study of meteorites will find everything needed for a great start in learning about meteorites. Take the Meteorite Test – 1. Decide which of these two rocks is the meteorite. 2. Click the picture to see which rock is the meteorite. One chapter in particular provides a side by side comparison of a real meteorite with a very good look alike terrestrial rock. The two stones are shown from the outside, both stones will hold a magnet. Both are the color that a true meteorite might be. Then the meteorite and the false stone are ground off a little with a diamond file exposing the insides. Close up photographs show what would be seen through a loupe and the real meteorite makes its presence known. Click to take the Meteorite Test when you think you know which of the above rocks is a meteorite. The entire book is filled with helpful information but this chapter includes some tips for the meteorite collector and hunter that might otherwise only be learned in a geology classroom. 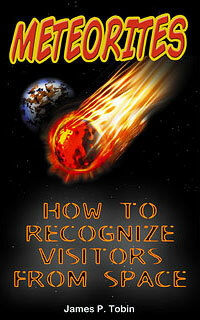 “Meteorites – How to Recognize Visitors from Space”, available on Amazon, was created for digital reading and is not a conversion from a printed book. This gives the reader rich color photographs that were enhanced to really show off the dozens of meteorite specimens presented. Every topic is covered from meteorites in history through where to send a stone that passes the test you are taught. 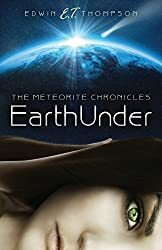 The author is an enthusiastic meteorite hunter having found over a hundred of these mysterious visitors from space himself. Meteorites are rare but meteorites are also out there to be found. Armed with the numerous photographs and wealth of information contained in “Meteorites-How to Recognize Visitors from Space”, this eBook will help you to be a more successful meteorite finder. The meteorite collector will find the book a must for comparing the specimens in a collection to the types beautifully shown in the book.